The following example has 2 velocity cubes. The first cube covers a large area with a smooth velocity profile. The second is a much smaller cube with a more detailed profile. The smaller cube is required for its detail and the larger cube is required to cover the area beyond the smaller cube. The objective is to smoothly blend the small detailed velocity model into the larger one. 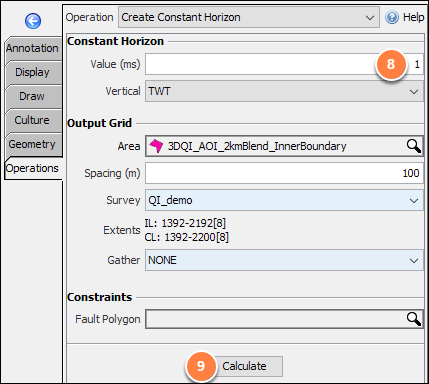 This approach uses horizon maths to create a map template containing values between 0 and 1 which defines the blend zone. This blend zone template is used to control the contribution from each volume at each location using volume maths to give a final merged volume. First we need two input volumes. The smaller cube on the left has more detail and will be merged into the smoother, larger regional cube on the right. If we try a simple join of the two volumes using Volume combine process, we see the boundary between these different volumes. Using a blend zone template to combine the volumes instead, the sharp transition between volumes can be reduced. If there is no horizon, the create constant horizon operation can be used to generate one. Select the Map view operations > Horizon Maths. Click the blue (+) button. 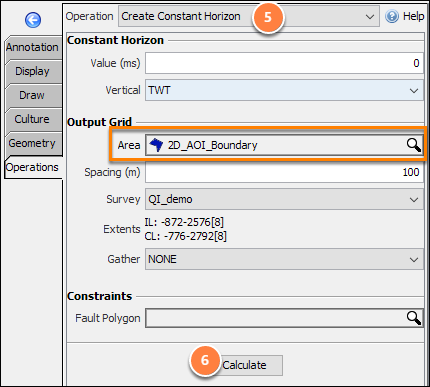 Select the horizon that covers the smaller volume Area of Interest (AOI). 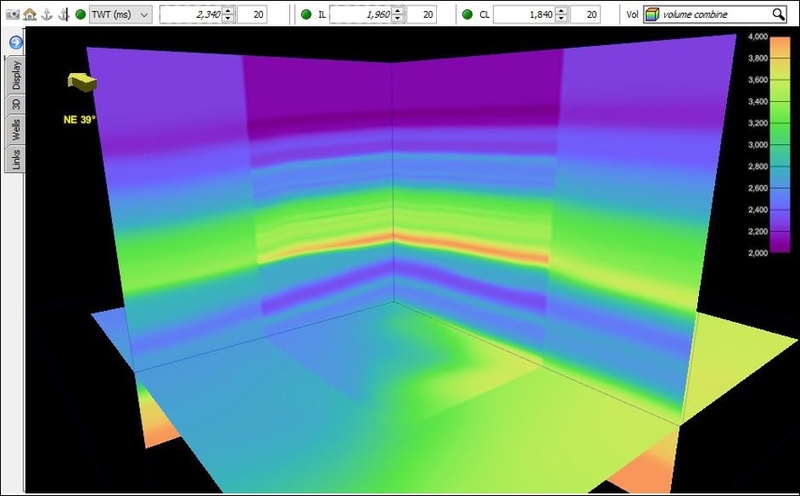 Click the spanner to associate the larger seismic volume to the horizon calculation. Change the horizon property to Amplitude. Click Calculate and create the new horizon. Consider regridding the resulting horizon to a sparse increment (e.g. 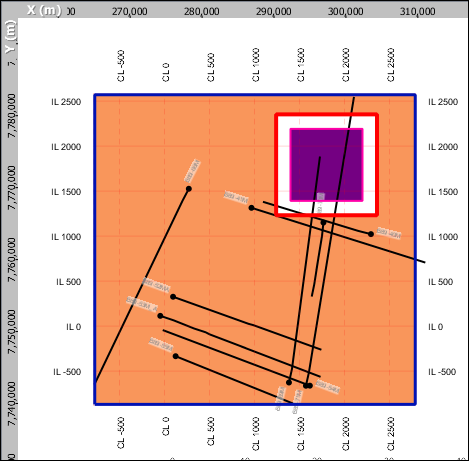 100 x 100m) (see Regrid). Create a polygon that matches the smaller volume. This can be done automatically by contouring the template horizon at value 0.5. Start at value 0.5, Interval 1. Smooth the map to control the feathering. Limit the smoothing to within the smaller volume polygon just created, where both volumes exist. Click the blue (+) button and select New Process. Double click on Volume Maths. Optionally use the volume smooth process on the final results to give a seamless transition. 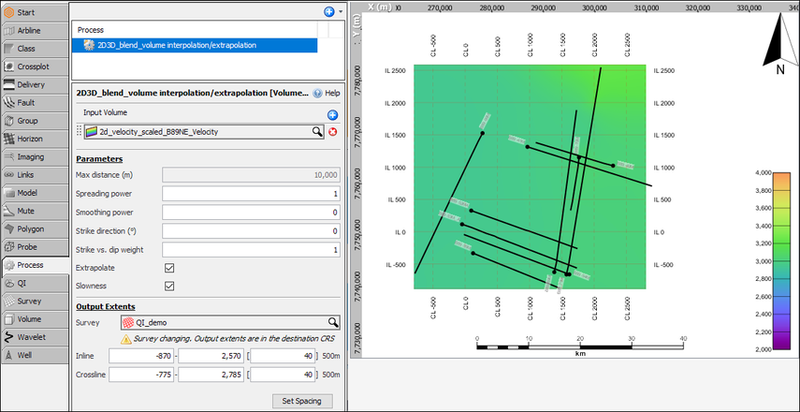 This follows the same overall workflow as example 1, but includes a mixture of regional 2D data that contains a smaller 3D survey. The smaller cube is required for its detail and the larger velocity lines are required to cover the area beyond the smaller cube. The objective is to smoothly blend the small detailed velocity model into the larger one. This approach uses manual polygon interpretation to create a map template containing values between 0 and 1 which defines the blend zone. This blend zone template is used to control the contribution from each volume at each location using volume maths to give a final merged volume. 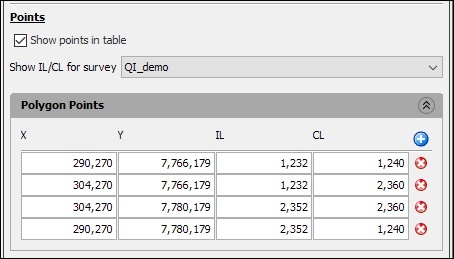 First we need two input volumes that exist on the same survey. 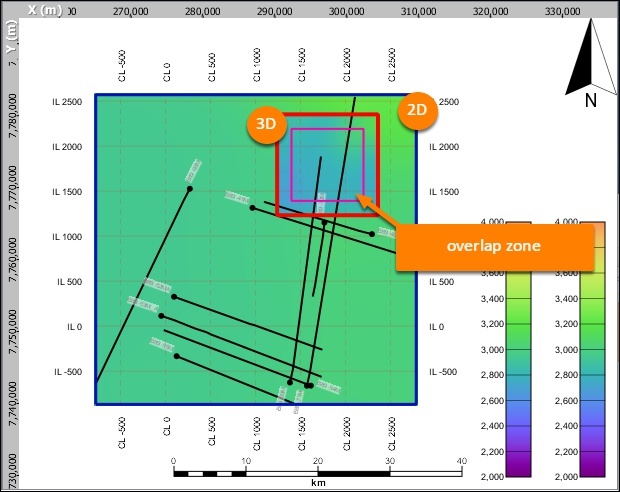 The 2D data only exists at the 2D line locations, and must be interpolated onto the same survey as the 3D volume using the volume interpolation / extrapolation process. Note: Use big increments in the interpolation process to maintain performance. The regional 2D volume will be merged into the smaller more detailed 3D volume seen here at the North East corner. To create the map, you will need to digitise polygons that cover the area of interest for both volumes of seismic velocities. 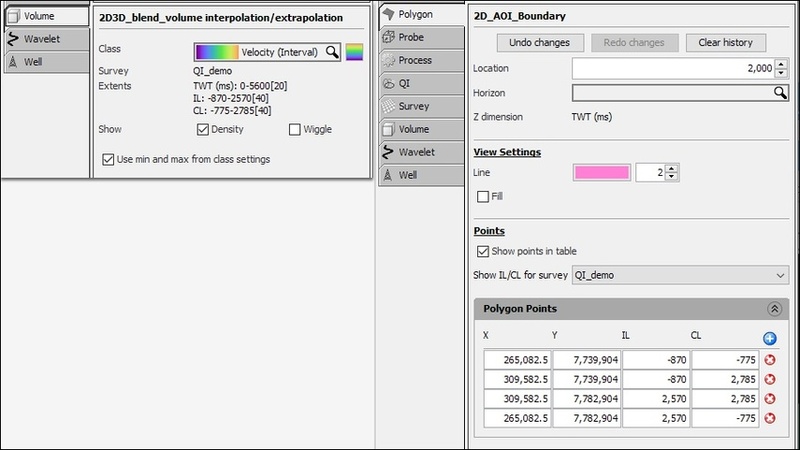 You will also need a polygon that marks the limit of the blend zone where the 2 volumes overlap. Create 2 new polygons to cover the 2D and 3D volume AOI (see Creating a Polygon). Hint: After picking an approximate boundary in the map view, you can show the points in table format in the control panel. 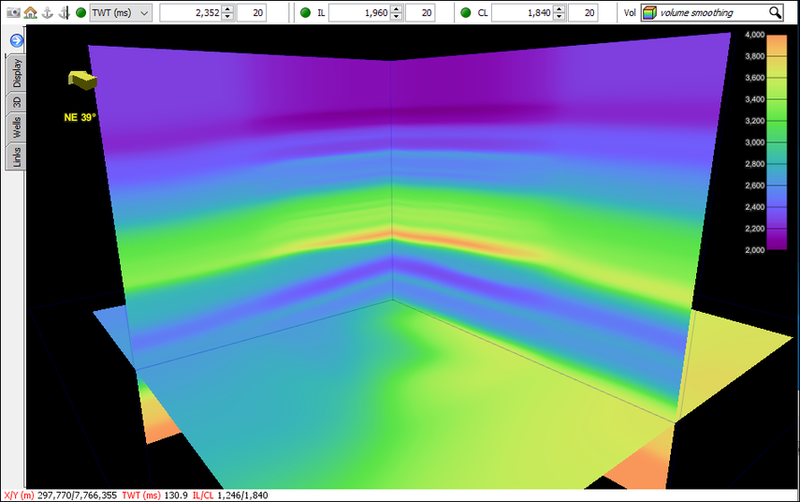 To make a more precise polygon you can enter the seismic volume geometry to tidy up the ILCL (XY) values for each corner. Show the polygon points of the new polygon, and edit them to create a smaller polygon within the original. This will mark the limit of the blend zone from 2D-3D, and the size is up to you. 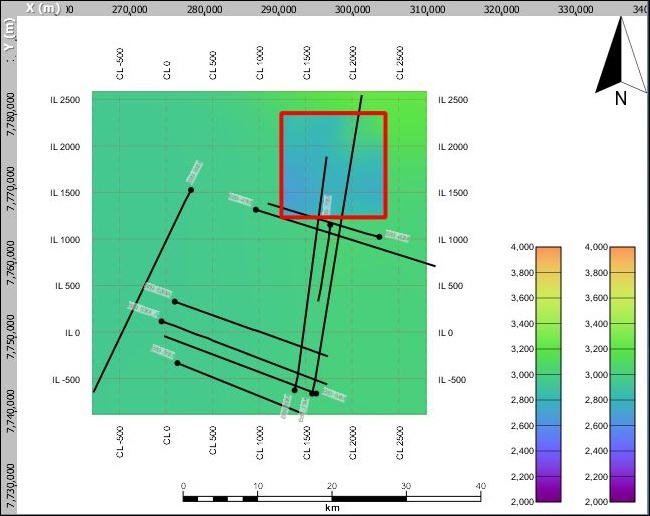 In this example 2 km were added to the min X & Y and 2 km were removed from the Max X & Y to make a 2 km wide blend zone. When finished there should be 2 polygons marking the 2D and 3D volume edges, and a 3rd polygon defining a 2km overlap zone where both volumes co-exist between the inner polygon and the 3D polygon. Go to Map view > Operations tab and Create a Constant Horizon with the value 0. 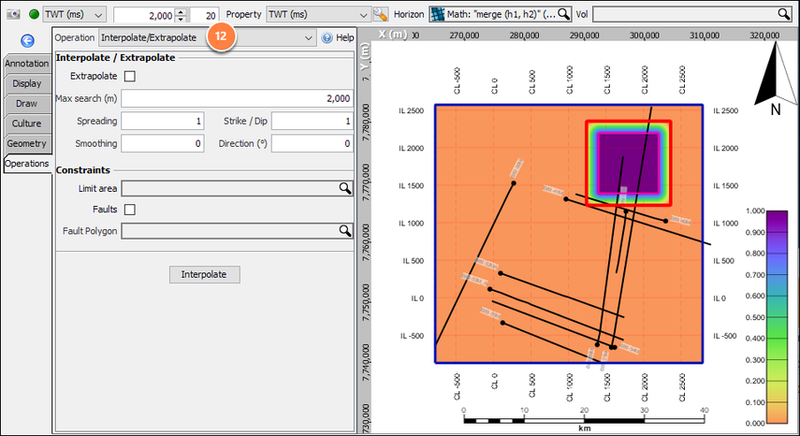 Set the fill Area to the polygon defining the 2D survey velocity. Click Calculate and the Create New button to continue. In the Map view > Operations tab, select Erase to create a hole in the horizon using the 3D polygon. 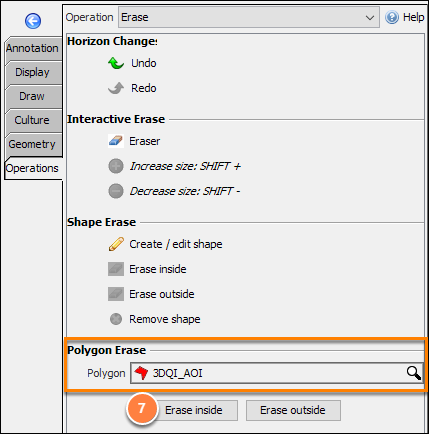 Click the Erase inside polygon button. Select Create a Constant Horizon and set the Constant Value to 1. Set the Fill Area to the polygon defining 2D-3D blend zone. Click Calculate and then Create New to continue button. Hint: Rename the horizons in the control panel horizon tab to make it easier to find them later. 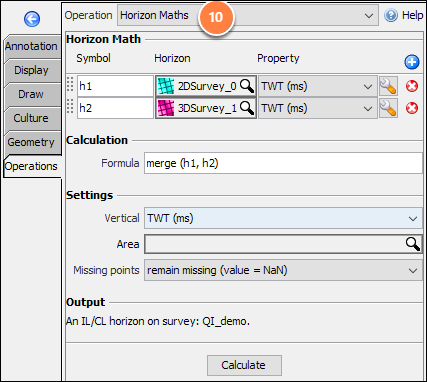 Select Horizon Maths operation and add the previously created horizons. Merge the 2D and 3D constant horizons together by using Formula: merge (h1, h2). Hint: Rename the horizon in the control panel horizon tab to make it easier to find it later. Use Operations >Interpolate/Extrapolate to fill the empty space between the values 0 and 1. Click on the blue (+) button and select New Process. 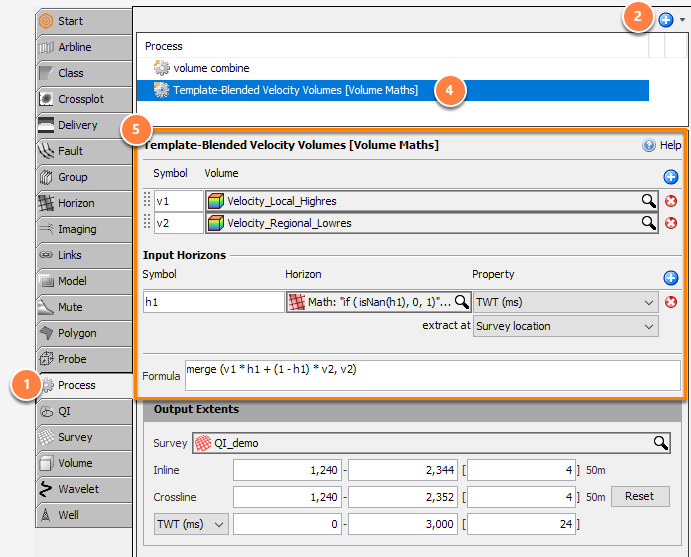 Create a Volume Maths process (read about Volume Maths process) and set the volumes as Symbol v1 and v2 (or equivalent). Assign the horizon template h1: Blend-Template Horizon. 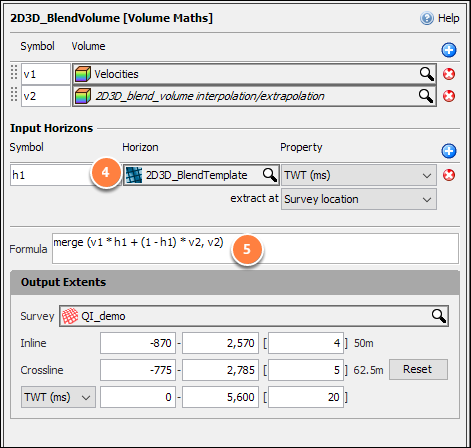 Merge the 2 volumes based on the just created horizon template using the Formula: merge (v1 * h1 + (1 - h1) * v2, v2). Finally, QC the results and adjust the polygon sizes as required to increase or decrease the blend zone. Optionally use the volume smoothing process on the final results to give a seamless transition.